28S-WAW-103D - 28mm Damaged Mid Terrace. Damaged Pre-painted Mid Terrace 1. What WWII battlefield would be complete without a building or several. Now you can get them war damaged!!! The Damaged Mid Terrace 1 is has the same great detail as all our World War II houses but with the incredible battle damaged detail these ruins create a fantastic looking battlefield. There is nothing stopping you mixing and matching this with other 4Ground WWII buildings. For extra realism you can use them to replace your Mid Terrace Type 1 after it has been bombed or hit by artillery, or you can use the different levels to make different damaged buildings. Each floor is removable allowing access to each one and the different rooms usable doors. To keep the floors in place there are little locking lugs in each corner. 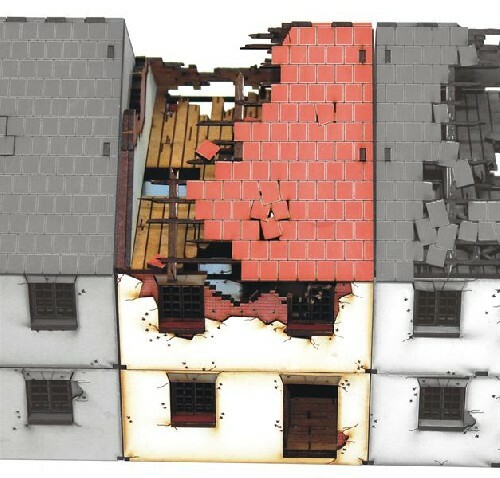 The pre-painted Damaged Mid Terrace is Designed to work with a Right & Left Hand Semi’s or additional Mid Terraces.